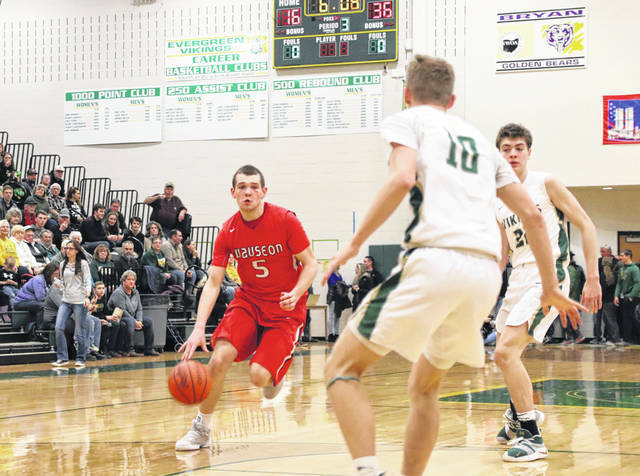 Levi Seiler of Wauseon advances the ball upcourt in a game at Evergreen this season. He was recently selected first team All-Northwest District in Division II. Rigo Ramos of Archbold at the foul line in a district tournament game at Lima Senior earlier this month. He finishes his career by making honorable mention all-district in Division III. 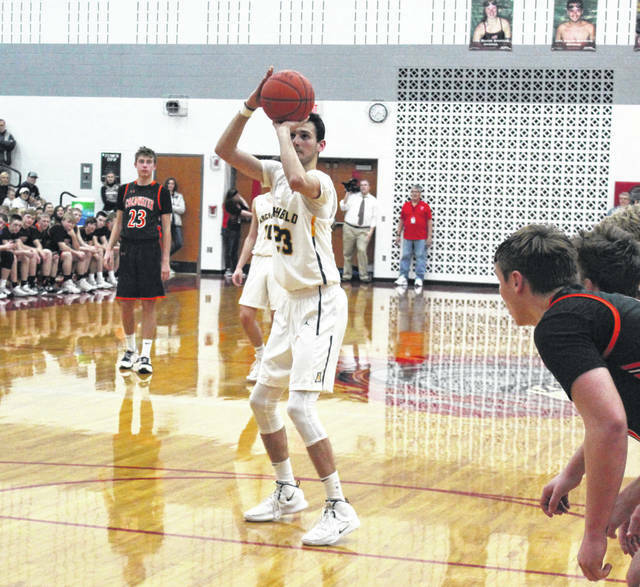 Trey Keefer of Fayette drives toward the basket versus Pettisville this season. He was named honorable mention all-district in Division IV. The Ohio Prep Sportswriters Association has announced their All-Northwest District boys basketball teams, and many local athletes were honored. Levi Seiler of Wauseon was chosen first team all-district in Division II. Third team all-district for the Indians was Trent Armstrong. In Division III, Austin Wiemken of Archbold made the first team. Second team all-district for the Blue Streaks was Jeron Williams. Receiving honorable mention were Rigo Ramos and Elijah Zimmerman. Evergreen had a second teamer in Mason Loeffler. Nate Brighton was named honorable mention for the Vikings. Archbold mentor Joe Frank was the Division III coach of the year. 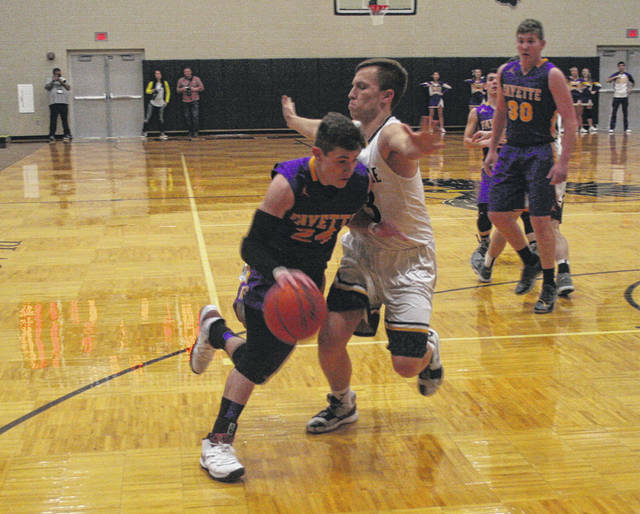 Pettisville’s Detric Yoder made the all-district third team in Division IV. Also for the Blackbirds, Graeme Jacoby was named honorable mention. Trey Keefer of Fayette was also honorable mention. Brandon Haraway, Norwalk, 6-2, sr., 20.5; Mason Montgomery, Vermilion, 6-3, sr., 19.4; Quan Hilory, Mansfield Senior, 5-10, sr., 19.0; Cade Stover, Lexington, 6-5, sr., 18.0; Levi Seiler, Wauseon, 6-4, sr., 17.3; George Mangas, Lima Shawnee, 6-2, so., 18.1. Player of the Year: Brandon Haraway, Norwalk. Co-coaches of the Year: Mark Triplett, Lima Shawnee; Marquis Sykes, Mansfield Senior. Tahj Staveskie, Sandusky, 6-0, jr., 16.0; Brennan South, Bellville Clear Fork, 6-0, jr., 14.3; Isaiah Alsip, Galion, 6-0, jr., 20.8; Adam Scott, Wapakoneta, 6-5, sr., 20.7; Jaron Sharp, Kenton, 6-2, sr., 22.3; Genesis Warith, Toledo Scott, 6-3, sr., 21.2. Derick Harrah, Clyde, 6-4, sr., 15.0; A.J. Blubaugh, Bellville Clear Fork, 6-3, sr., 12.9; Griffin Shaver, Ontario, 6-1, so., 13.1; Tyrel Goings, Defiance, 6-3, jr., 14.2; Trent Armstrong, Wauseon, 6-0, sr., 15.8; Drew Bagley, Van Wert, 6-4, sr., 12.2. Jacob Plantz, Genoa, 6-4, sr., 21.6; Owen Hiegel, Ottawa-Glandorf, 5-11, sr., 19.7; Jordan Burton, Cardinal Stritch, 5-10, sr., 15.0; Joey Holifield, Cardinal Stritch, 6-2, jr., 14.3; Austin Wiemken, Archbold, 6-4, sr., 15.8; Josh Crall, Bucyrus Wynford, 6-0, jr., 26.2; Luke Denecker, Bluffton, 6-1, jr., 19.2. Co-players of the Year: Jacob Plantz, Genoa; Owen Hiegel, Ottawa-Glandorf. Co-coaches of the Year: Joe Frank, Archbold; Chris Sheldon, Collins Western Reserve. Hayden Stone, Carey, 6-8, jr., 18.0; Cooper Parrott, Willard, 6-3, jr., 18.8; Karson Howell, New London, 5-10, sr., 16.8; Luke Rowlinson, Collins Western Reserve, 6-1, so., 13.2; Marcus Bruns, Coldwater, 6-2, sr., 17.7; Jeron Williams, Archbold, 6-0, sr., 12.5; Mason Loeffler, Evergreen, 6-4, jr., 15.7; Andrew Bench, Genoa, 6-5, sr., 13.1. Little Anderson, Cardinal Stritch, 6-3, sr., 13.3; Ethan White, Ottawa-Glandorf, 6-4, sr., 10.5; Mason Vent, Upper Sandusky, 6-3, jr., 17.9; Cole Frilling, Coldwater, 6-5, sr., 14.9; Carter Burdue, Liberty Center, 6-2, jr., 14.0; Jac Alexander, Oak Harbor, 5-10, jr., 22.2. Zeb Jackson, Maumee Valley, 6-3, jr., 24.5; Zach Hayman, Sycamore Mohawk, 5-11, sr., 21.8; Logan Niswander, Lucas, 6-2, jr., 20.1; Simon Blair, Greenwich South Central, 5-10, jr., 20.9; Nate Bruns, Maria Stein Marion Local, 6-6, sr., 19.5; Parker Thiel, Hicksville, 6-1, sr., 15.9; Chase Glock, Stryker, 6-6, sr., 16.0; Javin Etzler, Convoy Crestview, 6-7, sr., 14.2; Brody Bowman, Lima Temple Christian, 5-10, sr., 29.5; Josh Thorbahn, Ottoville, 6-5, so., 18.3. Player of the Year: Zeb Jackson, Maumee Valley Country Day. Co-coaches of the Year: Taylor Iceman, Lucas; Tony Tear, Hicksville. Eliot Cummings, Ottawa Hills, 6-4, sr., 17.8; Levi Gazarek, North Baltimore, 6-5, jr., 22.1; Jared Breece, Pandora-Gilboa, 6-1, sr., 15.6; Jacob Adams, Plymouth, 6-3, sr., 23.9; Caleb Stewart, Mansfield St. Peter’s, 6-1, sr., 16.1; Nathan Roesch, Sandusky St. Mary, 6-3, jr., 15.6; Jarod Schulze, Minster, 6-9, sr., 14.5; Caden Niekamp, St. Henry, 6-7, sr., 13.0; Gavin Feichtner, North Robinson Colonel Crawford, 6-4, jr., 16.0; Jared Wurst, Delphos St. John’s, 6-2, sr., 18.2. Chris Klopp, Sycamore Mohawk, 6-4, sr., 10.8; Zach Dewese, Old Fort, 6-2, so., 15.4; Nic Somodi, Tiffin Calvert, 6-1, sr., 14.5; Dylan Morris, Margaretta, 6-0, sr., 14.5; Payton Jutte, Fort Recovery, 6-2, sr., 18.9; Detric Yoder, Pettisville, 5-11, sr., 10.4; Nate Gerber, Wayne Trace, 6-5, jr., 14.0; Jordan Fenner, North Robinson Colonel Crawford, 6-0, jr., 16.0; Jamal Whiteside, Lima Perry, 5-11, sr., 18.2; Kalen Etzler, Convoy Crestview, 6-8, so., 13.0; Trevor Lambert, Kalida, 6-3, sr., 13.9.